Northrop Grumman has named its 10th Cygnus cargo ship the S.S. John Young in honor of the late Gemini, Apollo and space shuttle astronaut. The spacecraft will launch atop a Northrop Grumman Antares rocket from NASA's Wallops Flight Facility in Virginia with supplies for the International Space Station. NASA's first astronaut to fly six times into space (seven, if you count his launch off the moon) and command four different types of spacecraft will add one more vehicle to his credit, if only in name. 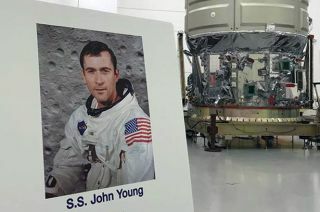 John Young, who walked on the moon on Apollo 16 and led the maiden flight of the space shuttle program, has been chosen as the posthumous namesake for Northrop Grumman's next Cygnus cargo spacecraft to resupply the International Space Station. Young died in January at the age of 87. The S.S. John Young is scheduled to launch atop a Northrop Grumman's Antares 230 rocket from Pad 0A at the Mid-Atlantic Regional Spaceport (MARS) at NASA's Wallops Flight Facility no earlier than Nov. 15. The uncrewed Cygnus spacecraft will be unloaded of its cargo and reloaded with refuse by the space station's crew before being released from the orbiting outpost to deploy three Cubesats and then perform a destructive re-entry into Earth's atmosphere over the Pacific Ocean. John Young, the spaceship's namesake, was a member of NASA's second group of astronauts selected in 1962. He served as pilot on Gemini 3, the first mission for the two-seat spacecraft in 1965, and then commanded Gemini 10 in 1966. On his third mission, Young became the first person to orbit the moon alone as command module pilot on Apollo 10 in 1969. Young became the ninth person to walk on the moon as commander of Apollo 16 in 1972. Nine years later, he led STS-1, the first flight of space shuttle Columbia. His final mission was as commander of STS-9, also on board Columbia, with the first European-built Spacelab module. In total, Young logged 34 days, 19 hours and 39 minutes in space. He is the only astronaut to have flown on Gemini, Apollo and space shuttle missions. Northrop Grumman's mission logo for the flight of its tenth Cygnus spacecraft, the S.S. John Young. The S.S. John Young will be the first Cygnus spacecraft to launch since Northrop Grumman acquired Orbital ATK in June. The tradition of naming the cargo vehicles began with Orbital ATK's predecessor, Orbital Sciences. The most recent Cygnus, which was berthed to the space station from May through July, was christened the S.S. J.R. Thompson after the president and chief operating officer that company. Other ships were named for the late astronauts David Low, Gordon Fullerton, Janice Voss, Deke Slayton, Rick Husband, Alan Poindexter, John Glenn and Gene Cernan. The S.S. John Young's NG-10 mission is an extension to Northrop Grumman's contract under NASA's Commercial Resupply Services (CRS) program. The flight will deliver 7,605 pounds (3,450 kilograms) of supplies to the space station. The CRS contract authorizes Northrop Grumman to fly 11 Cygnus missions with about 66,000 pounds (30,000 kg) total of logistics, crew supplies and research equipment to the space station. The first Cygnus CRS mission was completed in 2014. Under a follow-on contract, Northrop Grumman will provide at least six more resupply missions carrying an additional 44,000 pounds (20,000 kg) of cargo to the orbiting laboratory. In addition to the Cygnus, Young is also the namesake for a stretch of Florida State Road 423, which was named John Young Parkway in his honor. The control facility that NASA will use to launch its next-generation Space Launch System (SLS) was named the Young-Crippen Firing Room in 2006, in honor of Young and his STS-1crewmate.